The journal that covers the trip from Johnson City, NY to who knows where. It's July 13, about 12:30 Pacific time, and I'm sitting in a restaurant near the southern entrance to Yosemite National park, which happens to have wireless Internet access (albeit very slow). And it's the first time in a long while that I've had phone service, so I've been able to return some calls. Thank you to everyone who was concerned about my well-being...I am fine, it's just there isn't service in these parks (I'd much rather have that, than have them build cell towers in these nice areas). 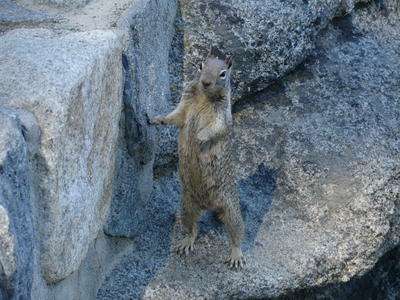 Yesterday, the 12th, I arrived at the Eastern entrance (Tioga Pass) to Yosemite around 9am. It's probably the most dramatic entrance into the park, as the alpine part of the park is on the Eastern side. I had great views just form my car seat, though it was a little nervewracking driving in, as there are no guardrails separating the road from the canyons below. I eventually got to the Western side of the park, which was more of a hilly/wooded area. I pulled off to the side to hike a 4 mile trail which, again, provided some great views. At one point on the hike I was sitting on a dead tree, re-lacing my boots, and I heard this loud crashing noise coming up from higher on the hill, somewhat like a porch door being slammed. I looked up, but saw nothing, and I just assumed someone else was out here. Further along the hike, I heard that crashing noise again, and it turned out to be a bear. Although the bear was probably 75 yards away, uphill, and heading in the opposite direction, it still got my adrenaline going a bit as it was big and it could move very fast. It seemed to be scared of me, though, so I was fortunate in that respect. It turned around one last time to look at me, then vanished behind some rocks. I was a little more vigilant the rest of the hike, but there were no more bear sightings. 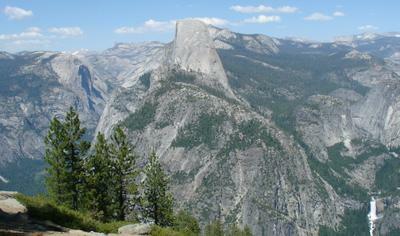 Yosemite is big on protecting its wildlife, especially the black bears that inhabit the park. When bears start getting into visitors' improperly stored food, their instinctive fear of humans eventually goes away and they have to be relocated elsewhere in the park as to not pose a danger to visitors. However, these relocated bears often try to find their way back and then must be killed. Bears have been known to cause thousands of dollars of damage to cars and camping equipment, and bears at Yosemite now recognize items like coolers and soda cans, so people have to be extremely careful when camping and heading out on trails in certain areas. The park offers large metal bins for visitors to store food and other scented items in so bears don't try to get into vehicles or tents. Bears have a strong sense of smell, and therefore might try to get into a car when it picks up the scent of sunblock lotion. 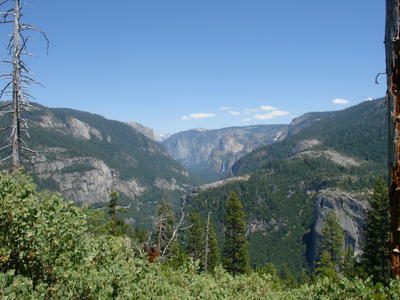 I made on final mini-trip for the day and headed up towards Glacier Point, which is high up in the hills near the center of the park. I avoided the road into the Valley and Yosemite Village, as all the visitors were flocking there. There were people up at Glacier Point, but not as many, and there were some great views of the mountains and waterfalls (which I didn't realize there were so many), and it was so beautiful people spoke in low tones, as if their regular voices were enough to disturb the scenery. It was getting later in the day, and I needed to find a place to sleep for the night. I had passed a campground earlier, Bridalveil Creek, that had a sign stating "spaces available," so I headed back down the hill. I grabbed one immediately as other people were coming in looking for spots every few minutes. I got my tent set up, and then the next step would be to remove all the food and scented items from my car and put them in the bear-proof bin. Needless to say, this was a lengthy process as my car is a mess as I have lived out of it for almost 2 weeks now. I also discoverd that my detergent spilled in the back, as well. So it took a while to get all that stuff out, but it did allow me to do a little cleaning and re-arranging, as well. I next began to walk back towards the entrance of the campground to pay my fee. On the way there, there were two girls driving around looking for spots, but not appearing to have much luck. Being that I had room at my campsite for another car and tend, and being that these girls were pretty attractive, I told them we could share the site and we'd split the fees. They jumped at this offer, not so much because they badly needed a place to stay, but they seemed entranced by my rugged wilderness good-looks. I'm sure the 3-days growth of beard sealed the deal. Anyhow, I got to know Allison and Bonnie over the evening...they were form San Diego and where on a 2 day road trip at Yosemite. They were pretty familiar with camping and the outdoors, and had everything you would need to set up camp. As we had a pit for a fire, we talked about how good it would be to roast marshmallows (anything is a treat when you've been living on raisins and granola bars). They didn't have any marshmallows, but we decided to head South towards the little area in the park called Wawona and see if the store there had any. Unfortunately, the store was closed, but it was nice going for a drive without actually having to drive, after being on the road for so long. Although we had no marshmallows, I was given a moonpie which I readliy devoured. It was a nice evening getting to talk with some people my age for the first time in a little while. I eventually went to bed, exhaused and sore from my earlier hike. It wasn't the best night of sleep, though...I was cold for the first time since I was in Western Virginia, and my tend was getting damp from the moist air in the woods. Also, in a campsite tent about 50 feets away, this guy was snoring so loud it was as if he was sleeping in the adjacent tent. I first wondered if there was a bear sleeping near my tent, but it turned out to be this one guy just being ridiculously loud with the snoring. I decided I'd move to my car and try to sleep, but that didn't turn out too good as it was cold in there, but at least I couldn't hear the snoring. 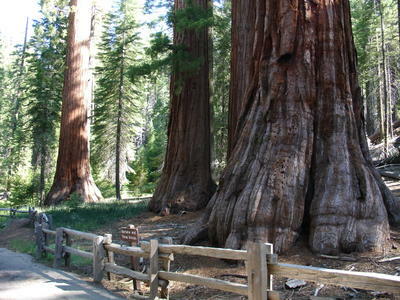 We all parted ways this morning, and I headed down near the Southern entrance to the park, where there are groves for Sequoia trees...and, as we learned at DJ Thad's trivia, these are considered the largest living organisms on earth (by volume), so I was curious to see what these trees looked like in person. Pretty enormous, right? Excluding skyscrapers, I have never seen anything so big. And these things can live as long as 3,000 years. I spent a good part of the morning at the grove, but then decided to head out of the park. As much as I'd want to explore some other areas, I had to keep moving as I was nearing the halfway point of my trip. So I'll leave this restaurant eventually and head towards Sacramento, which will probably take a mere 3 hours or so. I'll see my brother Mike, spend two nights there, and head further north on the 15th. Thanks to everyone who took time to sign the guestbook and make comments...you guys crack me up.